Phobya's NanoGrease Extreme, designed to gain the last bit of cooling performance in the high-end sector! Best paste ever!!! This thermal compound is of course not only well-suited for the high-end sector, the normal user can also profit from this product. It allows better cooling performance for an existing system with little effort. Phobya has developed a product which offers exceptional performance with a thermal conductivity of 16W/mK! But a thermal compound not only needs to offer great thermal conductivity, it must also be easy to use and apply! it is especially important that the compound can be applied in a very thin layer on the heat source to have as little distance between heat source and cooler as possible. Not only the optimal viscosity of 85000cps TF makes this easily achievable with this compound, the right tool is also included! A handy plastic spatula is included with the Phobya thermal compound. If only part of the compound in the syringe is used, the screw-on cap will preserve the rest of the compound and keep it fresh. And should the compound ever be spilled, there's no need to worry: it is electrically non-conductive. 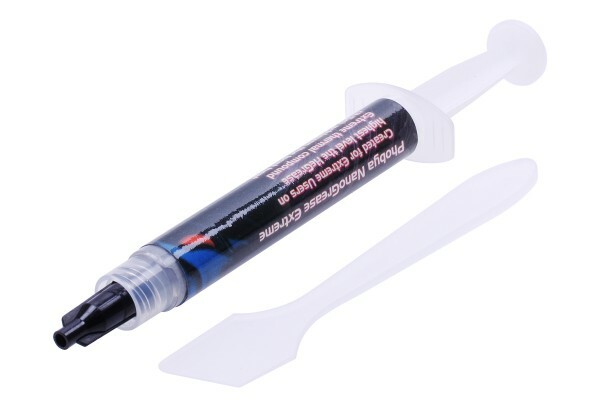 This thermal compound is perfect for YPU, GPU or Chipset applications. Please note: Keep out of the reach of children. In case of contact with eyes, rinse immediately with plenty of water and seek medical advice. Классная термопаста, густовата на мой личный взгляд, но с поставленной задачей справляется на ура!! !